Thoughts, whether good or unhelpful, are what we think. Let me tell you a story about living the thoughts we think. 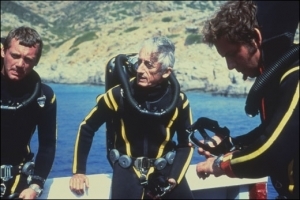 As a child I used to watch Jaques Cousteau’s Underwater Adventures avidly on T.V. I soaked in every fascinating detail. Whilst doing a school project, I created a story book about Underwater Exploration. In my mind I would hear clearly the voice over and then I would interpret and write in my own words and thoughts about what was so thrilling about sea diving. I threaded into the description my own Father’s enthusiasm for diving. He was the founder member of the Birmingham Underwater Diving Club. Diving was new to Britain when as a family on holiday in Babbacoombe Bay, Devon. You could hire snorkelling equipment and my Father took the opportunity to try it out. My mother joined us on the beach after his first diving experience with a lovely liberating smile. He had found his passion. Later, at the age of ten I became “Tadpole number one”, after I’d accompanied him to his diving training so many times at our local swimming baths. We were landlocked where we lived and could only make the journey to the sea on high days and holidays. I gained his enthusiasm for the water and of ‘tank diving’ as it was called then. The Underwater Club rapidly gained new members. They would then organise demonstration events to show off this brand new sport to a growing band of spectators and enthusiasts. Club members would take it in turns to make running commentaries from the poolside, explaining the fascinating details of the events unfolding. And then it would be my turn! I was a small girl, but my spirit was tall. After my introduction I would waddle my flipper feet down the steps at the poolside. Strapped to my back was a tiny aqualung the members had crafted for me, adjusting my mask I’d enter the water, flippers moving rapidly. I swam the length of the pool underwater. This was before the times of Health and Safety! For those brief moments I was in my zone of total focus on the experience. Reaching the other end of the pool – as I surfaced, I heard an unfamiliar sound – applause! It added enjoyment to an already special event. I showed my parents my finished story book and although pleased with my efforts, but they appeared to not to believe that it was all my own work! I have concluded from this story that we are all observers in our minds and our unfolding lives. We interpret our thoughts according to how we ‘see’ our days. When we’re in our zones, on track, nothing interferes with our direction. We are positive and calm. If however we become diverted into negative thoughts, we veer off track. We lose our direction and become anxious and despondent. Good or unhelpful – we live the thoughts we think. By learning how to direct our thoughts into our desired direction we can chose how we wish to’ be’ in each precious day. In spite of circumstance we do have choice.